Corrugated board is essentially a paper sandwich consisting of corrugated medium layered between inside and outside linerboard. 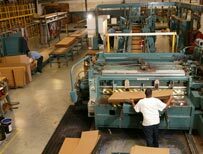 On the production side, corrugated is a sub-category of the paperboard industry, which is a sub-category of the paper industry, which is a sub-category of the forest products industry. On the marketing side, it is a part of the packaging industry. Throughout the distribution cycle of moving goods from producer to consumer, corrugated is the most widely used kind of shipping container. Traditionally, corrugated is best known for its structural strength that offers protection to packaged products throughout the transportation cycle. However, it has evolved over the course of time and today it is a much more versatile product.